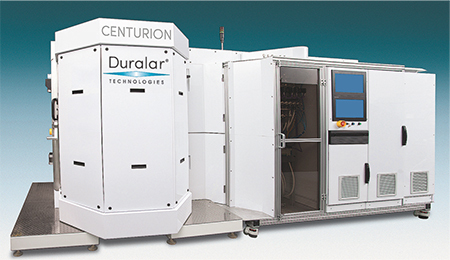 Duralar Technologies, Tucson, AZ, developer of advanced, ultra-hard metal coatings and coating machines, has introduced the Duralar CS-50 deposition system, able to coat both the inside and outside surfaces of metal parts using a proprietary process called DualArmor. “The CS-50 system features a tubular processing chamber that opens like a clamshell, allowing metal parts to be placed inside for coating,” says Duralar CTO Tom Casserly. “DualArmor coating employs a unique hollow cathode plasma-enhanced chemical-vapor deposition process to bathe the parts in an extremely intense plasma—roughly 1000 times greater than a standard CVD plasma. This enables parts to be coated at a high rate. Also, the chamber eliminates the line-of-sight limitations experienced with spray-type coatings. Since all deposition occurs within the dense plasma, all part surfaces receive a uniform coating, eliminating the need for post-processing rework." The CS-50’s unprecedented deposition speed enables the use of thicker hard coatings than were previously technically possible or commercially feasible. Previously, conventional diamond-like carbon coatings had a practical total thickness limit of around 5 µm; Duralar DLC coatings can be 50 µm or more. DualArmor coatings reportedly can provide 5 to 10 times the hardness of carbon steel and more than 10,000 times greater wear resistance than Type 304 stainless steel. The coatings feature high levels of corrosion and erosion resistance, and they are virtually frictionless, with a friction coefficient of less than 0.08.